A fascinating city where architecture is fresh and the food is delicious. Seoul is a city very dear to me. It was there that I had my first adventure in the far east when I accepted a job offer in town in 2009. Back then, I had no idea what it was like to land in a place where everyone and everything is different from you and what you are used to. It was a shock, but a good one. The people were great, the culture of the place fascinating, but it was the food the left the deepest impression on me. Deeper, even, than architecture. The delicious, street-bought Topokki, soft rice cakes with savory red sauce, scallions and fish cakes; the comforting Bibimbap, rice with toppings served in a hot stone bowl; the joy of sharing Korean barbeque with friends, accompanied by cold shots of Soju; grilled mackerel, served with only salt and lemon and needing nothing else; even simple fried chicken, elevated to Korean standards and washed down with liters of cold beer on a Friday night. I was hooked, and until today Korean food is easily on my top-five list of best cuisines in the world. 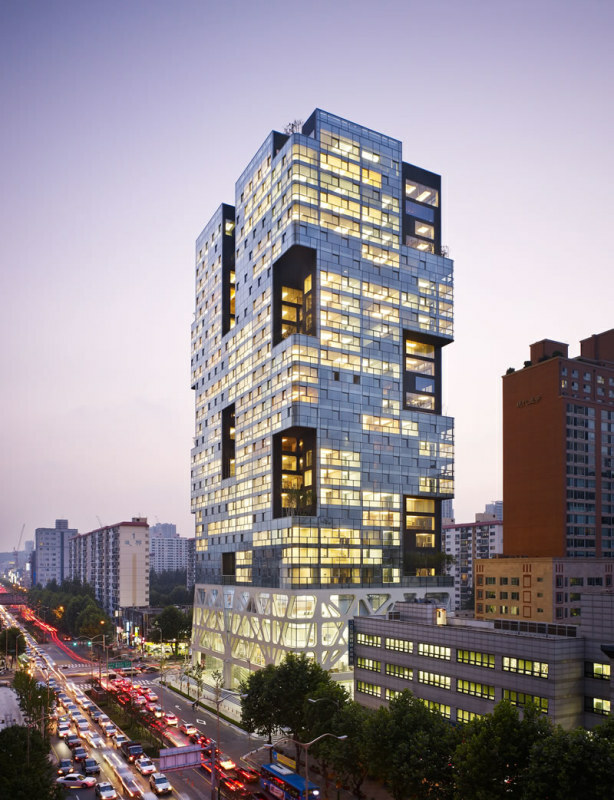 Contemporary architecture in Seoul, at that time, was starting to show its face to the world. Offices such as Mass Studies were building more and more, and huge projects such as the Dongdaemun Design Plaza from Zaha Hadid were being erected at a fast pace. Seoul of today, therefore, is a much different place. Zaha's DDP is finally open; the city is about to inaugurate its first supertall, the Lotte World Tower. Thanks in part to PSY and his pop hit Gangnam Style, new hype projects in that neighborhood are popping up on every architecture website, and new exciting local offices are gaining traction in this bustling market. In the meantime, it should help you get started. Here is the map of everything I mention in the article and more (last updated on May 25th, 2018). Black icons were visited in person and/or are mentioned in the guide below, while gray icons are further recommendations, not necessarily tried or visited. I first visited the site back in 2009, when it was still a hole in the ground. I quickly dismissed it as another weird building by Zaha, but I was so wrong. 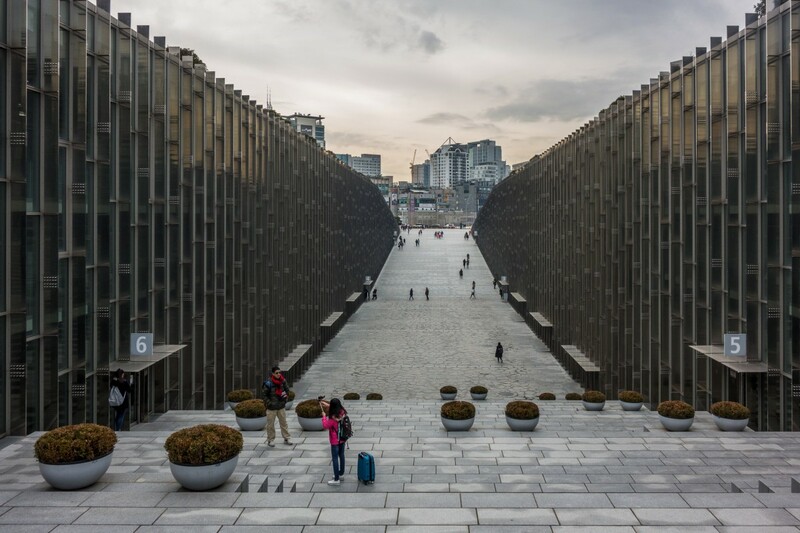 It is a quirky, strange building, which manages to deliver fantastic outdoor public spaces and a wide diversity of interior spaces, fulfilling its function as a new meeting point for Seoul. 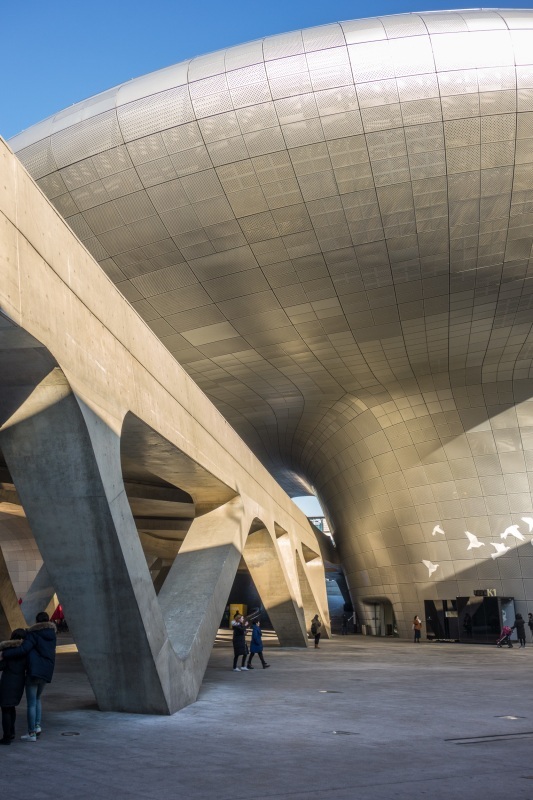 It is a must-see for any architect visiting Seoul. You can get into it without paying for any tickets, as there is a lot of public circulation around the main galleries. [Check online](http:// http://www.ddp.or.kr "DDP's official website") for all the exhibitions going on to see if anything interests you. Otherwise, just walk around and try to get in as many rooms as possible, many are just open and you can have a peek inside. Do plan to spend some time walking outside, though, as the park and public spaces surrounding it are, for me, the best part. If you manage to come in by the end of the day, the lights usually come on right after sunset and it is quite interesting to see how they managed to make such a solid-looking building during the day look alive and transparent at night. You can reach it easily via subway at the station Dongdaemun History and Culture Park Station (Lines 2, 4, and 5 - exits 1 or 2). ... try some delicious street food just across the street from the DDP. For a more substantial meal, walk 5 minutes northwest to Honam Jip, the best grilled mackerel in town (check the map for details!). Rem Koolhaas, Mario Botta, Jean Nouvel. Three architecture giants. Few cities are lucky enough to have some of their masterpieces part of their urban fabric, but even fewer are lucky enough to have all three of them, part of the same compound. Enter the Leeum Samsung Museum, a complex of two museums and an education center done each by one of the architects above, standing proudly on the hills of Itaewon. 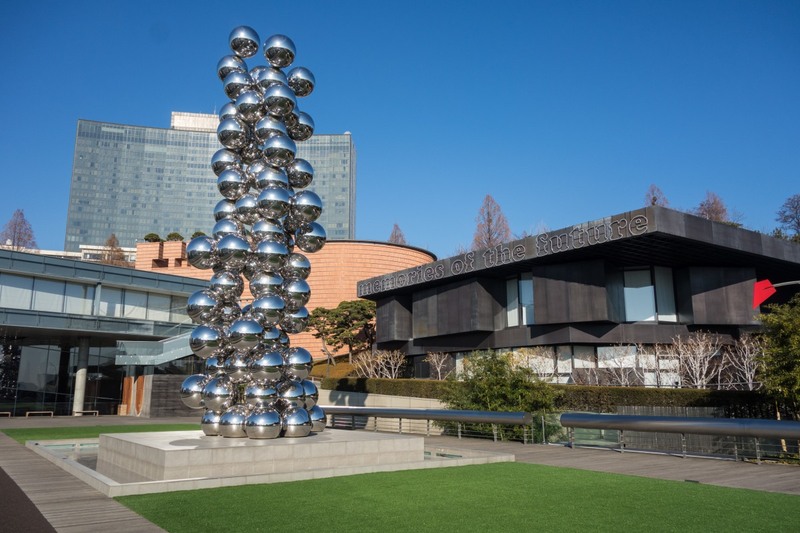 Hidden in the back alleys of this expat neighborhood, the Leeum Samsung Museum was inaugurated in 2004, housing a mixed permanent collection of Korean traditional artifacts and contemporary national and international artists, as well as frequent temporary exhibitions. Coming up the street, you can see all three buildings at once: Koolhaas's glass and concrete blocks, Nouvel's black metal boxes and Botta's terra-cotta cylinder. In front of it all an elevated sculpture garden, at the time of my visit housing huge reflective sculptures by Anish Kapoor. It is an impressive ensemble, Nouvel’s building being, IMHO, the most intriguing. The entrance is underground, in a space where all three buildings meet. Museum 1, designed by Botta, houses a collection of traditional Korean artifacts and is characterized by its central stairway atrium. It is beautiful: a white funnel spiral atrium, bringing light all the way down to the lobby, serving as the main circulation through the four floors of the collection. Museum 2 was by far my favorite. 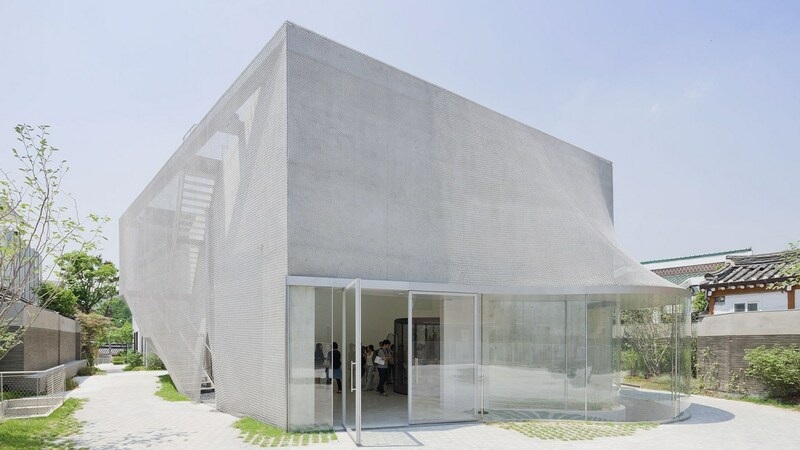 Designed by Nouvel, it houses various works from international and Korean contemporary artists. The building is incredible. Its black walls made of rusted stainless steel (invented especially for this building! ); the column-free space in the middle out of which smaller boxes stick out, offering a range of possibilities to exhibit and experience art; the clear glass offering views not only to the outside city and garden but also to the unique sunken gardens bordered by massive stone walls. It all contributes to an amazing experience, a building that starts in the underground and shoots up as if reaching out to the sky. Koolhaas building is undeniably his. Housing the Samsung Child Education & Culture Center, it is large space with tall concrete columns and a glass facade, housing another smaller volume, rendered in beautiful black concrete, and all exhibition areas occupying the spaces in-between. A wide diversity of surfaces and volumes allowing for a large variety of uses. At the time of my visit, a temporary exhibition from Olafur Eliasson showcased not only great art but also the flexibility of that space. The garden is open and free to visit, and chances are you’ll be able to see one or two great sculptures by great artists standing there. Outside you can also walk around the buildings to see all the details. 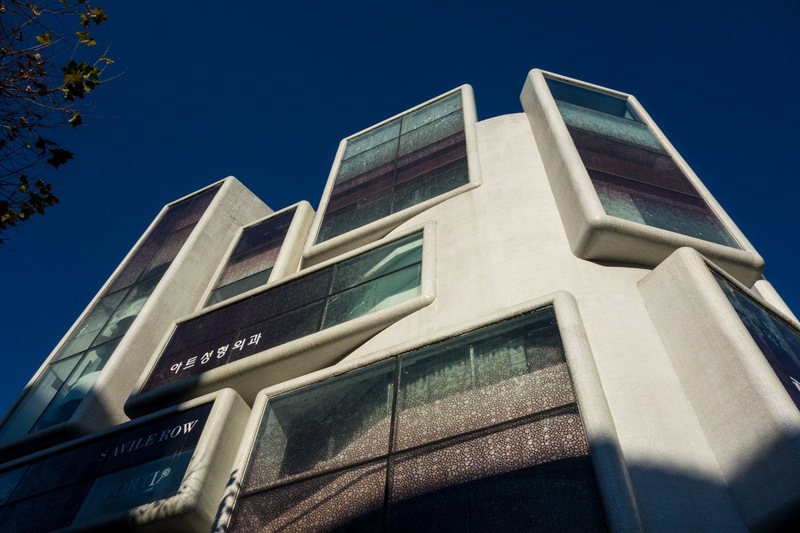 Inside, you can visit Museum 1 and 2 after buying a ticket (10,000KRW). If I only had time to see one building, it would certainly be Nouvel’s, if not for the building itself, also for its collection. Botta’s building is worth for its atrium and the way the exhibition is displayed. Koolhaas's building, if hosting any interesting exhibitions or events, is definitely worth a visit. Unfortunately, all exhibitions have a no-camera policy. You can get to the Leeum from Hangangjin Station (Line 6, Exit 1). It is a university, but open to the city. There are no closed gates or identity checks. Do plan to spend some time there to take the project in, just sit and watch how people use the spaces and circulate through the building. You can also get in, but it politely asks visitors to keep off of classroom areas. There are some public areas at the bottom of the valley where you can get in to take a peak, and the roof garden is freely accessible. You can reach it either by subway Line 2 (stop Ewha Woman's University) or Gyeongui Jungang Line (Sinchon stop). I am not a fan of malls, but this one, designed by South Korean architects GA.A, is one of the few malls that I truly like. 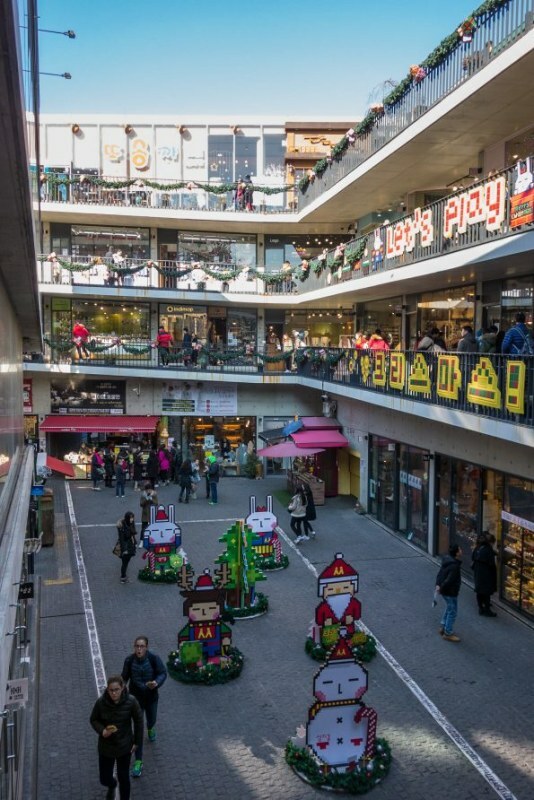 To start with, it is located in Insadong, where one of my favorite pedestrian streets connects with many small little alleys full of shops, cafes and street food. The mall works with that and recognizes the importance of this street life by creating an alley that continues from the street all the way up the building. It spirals up around a large courtyard, passing along small shops and ending on the rooftop area, where gardens, resting spaces, and coffee shops create a bustling public space. It is very a very popular and unique little mall. There is always something going on in the inner courtyard, an exhibition or event. On your way up the ramp, you can check the shops, all original and local, lots of handcraft and unique products. In the end, grab some unique handcraft Korean goods, a coffee, and snacks, while checking the view from the top. You can reach by subway at Anguk Station (Line 3), Exit 6. The Jong-ro Tower is a classic I still did not go visit. It is also a bizarre tower: three sections, one triangular base, one rectangular mid-section, and a large ring at the top, connected by three exposed elevator cores. But it somehow fits perfectly to its context and to the idea we westerners have of neon-lit futuristic big Asian capitals. You can reach the tower by subway, Jonggak Station (Line 1, Exit 3). The top ring houses a restaurant and bar with supposedly amazing views of the city. Since I first saw plans for this project I was very curious to see how it would turn out. Unfortunately, it became one of those projects that are so over the top and complicated, that you are left wondering “why?”. The idea is interesting. Adding a building that works as an extension to the public square in front of it, respecting the existing Old City hall building and embracing it in a transparent swooping gesture. But the result is just a very wacky building. From a glance, it is impressive, but at closer inspection, it reveals itself as a mess of structure and patterns. The bulging front facade has such a massive space frame holding it up that, from the inside, it is the only thing you can see. Add to it the geometric patterns on the side facades, or the oval object at the top sticking out, and it is all very confusing. Such an important site and program, and such an interesting idea, messed up by technical restrictions and bad execution. Another missed opportunity. Try to pass by it on your way to somewhere else, but do not make it a destination. You can reach it easily by subway, Line 1, City Hall Station. ... walk north towards the Palace, another beautiful attraction for first-time visitors. After that, you'll be even hungrier, so do yourself a favor and try a must-eat to anyone interested in Korean food: Samgyetang at Totsokchon. It is a traditional soup with ginseng and a whole little chicken served on a hot bowl. The restaurant is a classic in Seoul, and supposedly the best Samgyetang in town (check the map!). This is another building that was not there when I first came to Seoul in 2009, so I looking forward to seeing what came to be of the famous competition for the Museum of Modern and Contemporary Art. 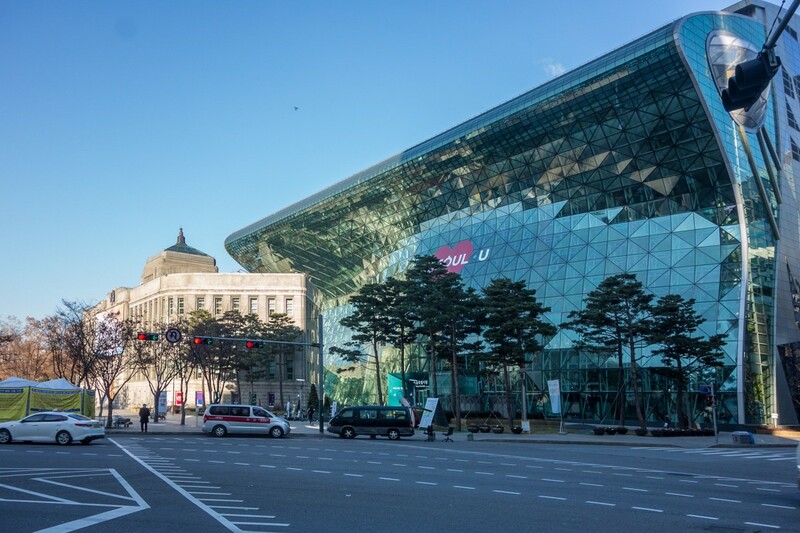 In its prominent site right next to the Gyeongbokgung Palace, the MMCA is wonderful. The building starts on the brick-facade of the old Defense Security Command, renovated and standing proud as the memory of the site. What seems like a small gallery museum, opens up to reveal large exhibition halls spread on the site. But the architect’s accomplishment is that they do not feel huge. A lot of it is underground, and the friendly scale of the elements above ground fits so well within the context of its historic neighborhood. A public path lets you cross the museum site, along which courtyards open up to reveal the buildings inner workings, as well as historical buildings preserved on the site. The change of scales, directions, and elevations of this public path offers a great way to experience the building and its surroundings. A lot of it is freely accessible. The entrance building houses shops, through which you can reach the first courtyard. 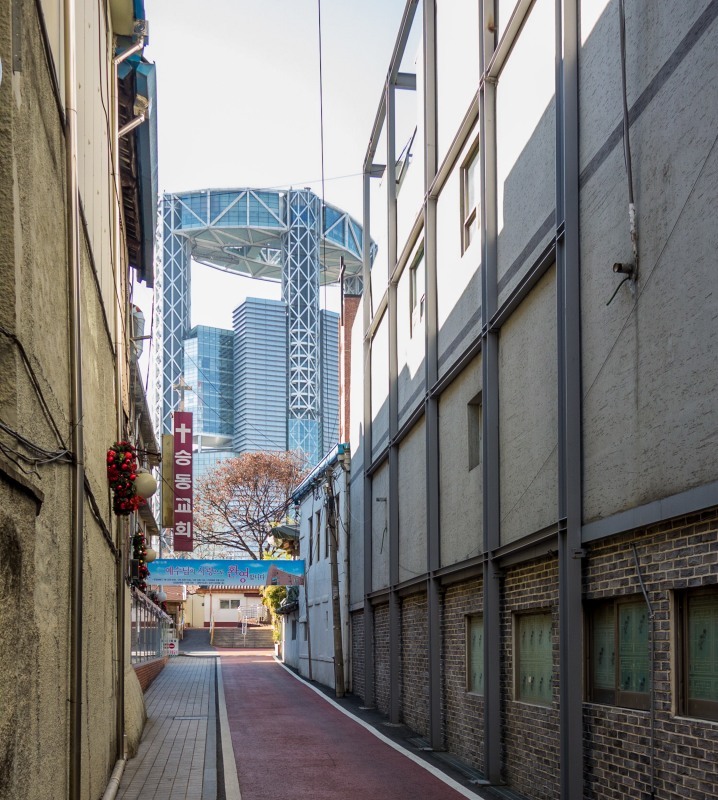 From there you can take a passageway up all the way to the back of the site, leaving you in the small streets of the Samcheong-ro neighborhood. Due to my short time in the city, I did not get in to check the exhibits. On my to-do list for the next visit. You can reach it by subway via the stations: Anguk (Line 3 - Exit 1), Gyeongbokgung (Line 3 - Exit 5), or Gwanghwamun (Line 5 - Exit 2). ...one of my favorite Mandu restaurants is just beside the Museum. Mandu are Korean dumplings, served alone or in a clear soup, called Manduguk. Just go there and try. They make their dumplings fresh every day and it is delicious (check the map!). The Samcheong-ro neighborhood is very popular in Seoul due to its old-style houses lining up its small streets and alleys, full of cafes, shops, and galleries. Chances are you’ll eventually stumble upon some interesting exhibitions around the area. On my visit, I had a list ready, had reserved a whole morning to do some gallery hopping, only to find them all either closed or changing exhibitions. The Kukje Gallery 3 gathered a lot of attention online when pictures of its simple white body wrapped in a metal fabric made their way into popular architecture websites. So I was curious to go take a peek. Unfortunately, also closed. 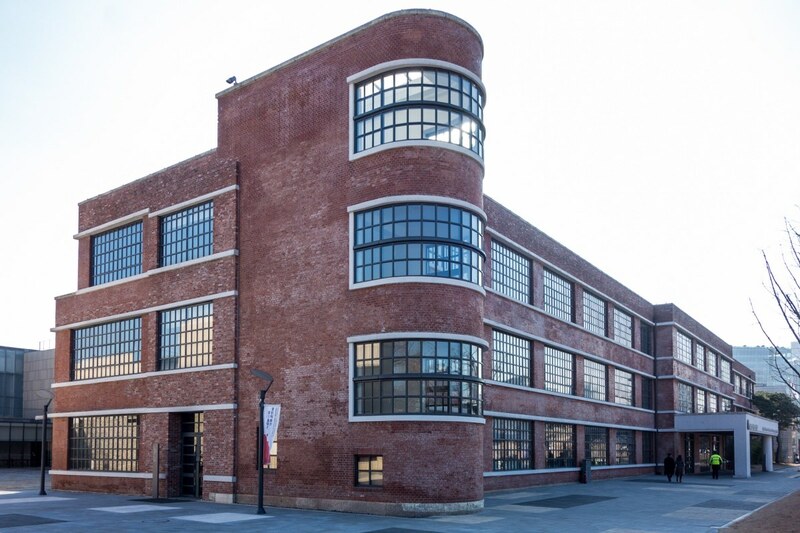 It is one of three buildings which compose Kukje Gallery, and it was the only one not open. Tucked behind the parking lot of Kukje, it was also quite tricky to find. The building is indeed interesting and striking, the metal fabric around it adding a lot to its character, and the volumetry is simple yet intriguing. Another one on my to-do list for the next trip. I’m curious to see how the interior is working, and also how the roof terrace is used. You cannot see it from the street, as it is hidden behind a building. But follow the map below and you’ll find it. And check the official website beforehand for exhibitions, maybe you can catch it open! You can reach it by subway via the stations: Anguk (Line 3 - Exit 1), Gyeongbokgung (Line 3 - Exit 5), or Gwanghwamun (Line 5 - Exit 2). The Chungha Building was another one hard to find. We used it as facade reference for a recent project, so I was quite curious to see how it looked in person. 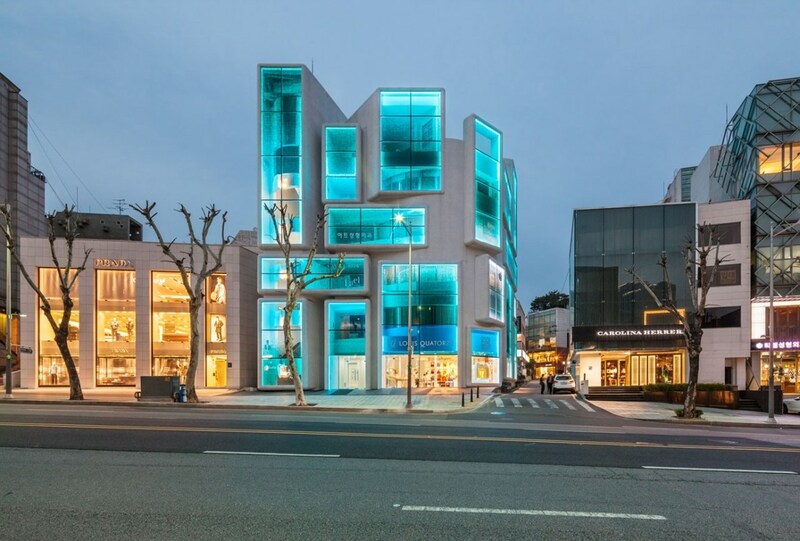 MVRDV’s job was to renovate an existing commercial building which, among its newer fancy luxurious brands stores, was out of place on the chic and expensive Apgujung Road. They accomplished it by creating these large windows with thick soft frames, jutting out of the building body. At night, LED lights illuminate the windows giving the building a fresh and contemporary appearance. I was most impressed by the materials. The walls look like smooth plaster from afar, but upon closer inspection, it reveals a mosaic glossy texture, which is also repeated in the window glass panels. It all contributes to turning it into a fun modern building, much more interesting than all its too-cool-to-be-true neighbors. The Apgujung Road is an 8-lane avenue lined with luxury big name shops. You can see some interesting buildings along the way, but I would just drive directly to the Chungha. The closest subway station is Apgujeon Rodeo, take exit 2 and follow along Apgujung Road until you see the building on your left. Another fantastic tower by MASS Studies. As in the S-Trenue tower, the architects tried to combine developer wishes and planning regulations into something creative and original. By removing chunks of what would be a simple c-shaped extruded tower, they created voids throughout the building that serve as gardens and light wells for its occupants. Additionally, they escaped from the simple floorplan repetitions and developed 49 different typologies of apartments combined in varied ways to complete 172 units. It's a building that never gets boring. The building is placed on top of a commercial plinth open to the public. I have not been there, so I'm not sure about the possibility to go up and take a peek. You can reach it via the subway station Gangnam, line 2, exit 9. 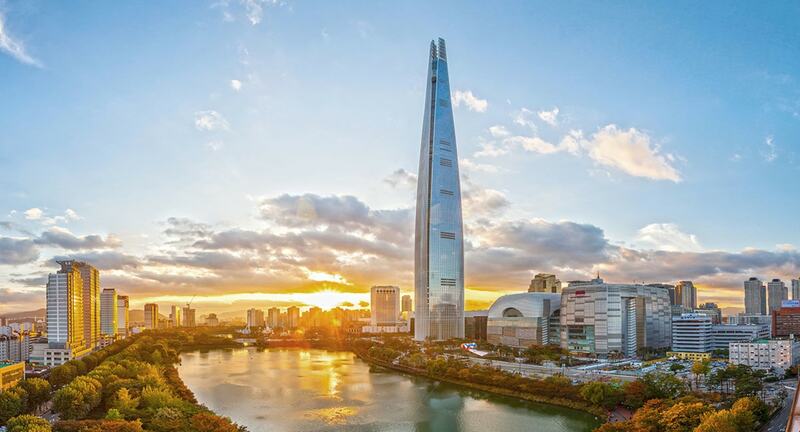 Seoul’s first super tall, KPF’s Lotte tower is a 555m tall building located in Gangam. Its shape is quite unique, if not a little weird: it looks like a corn ear, half-open, or like a large rocket ready to take off. 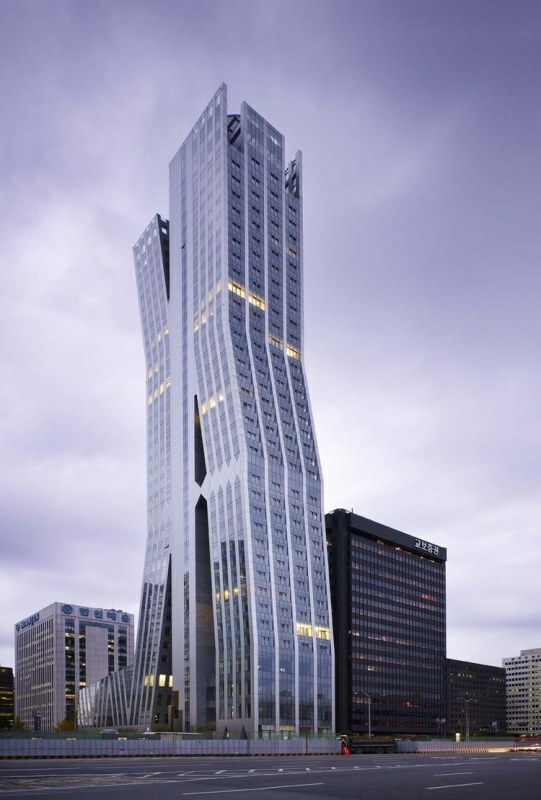 Add to that the funny-looking split tip, and you have a one-of-a-kind skyscraper. Surrounding it, another gigantic shopping mall, over six floors of shops and restaurants, half of it just for luxury goods. Unless you are into this kind of stuff, just skip it. At first, I thought the tower was only accessible through the mall, for me a huge disappointment. But, to my surprise, it stands mostly free. Instead of approaching it through the mall, you can approach it by the opposite side along a lake, a much more suitable setting for such a scale. At the time of my visit, it was still not finished, so no visiting allowed. But I believe its future observatory at almost 500m height will be a must-visit destination in Seoul, competing to the Namsan Tower as the best view in town. The tower is set to open in April 2017. The top ten stories of the building are originally reserved for public functions, and the observatory will certainly be worth a visit. Update: the tower is open since April 2007. 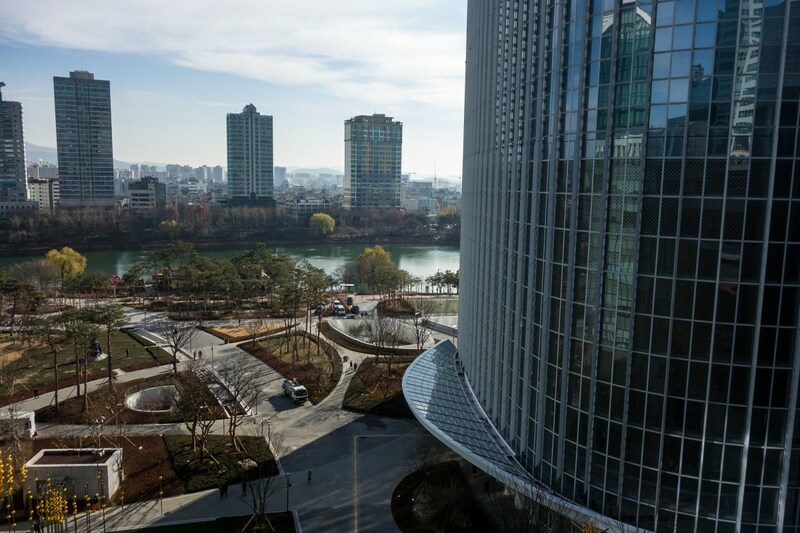 It's observatory inaugurated right after and the LOTTE Museum of Art opened on the 7th floor of the tower in January 2018. The Lotte World Mall is gigantic and luxurious, if you are into this stuff you can have a blast there while the tower is not open. Otherwise, you won’t miss much to just skip it and enjoy other more interesting stuff to see in Seoul. You can reach by subway, Line 2, Jamsil Station, exits 3 & 4. The first skyscraper in Seoul, the 63-Building is quite striking in its 80’s aesthetics, with a shiny golden facade and sleek skirt shape. 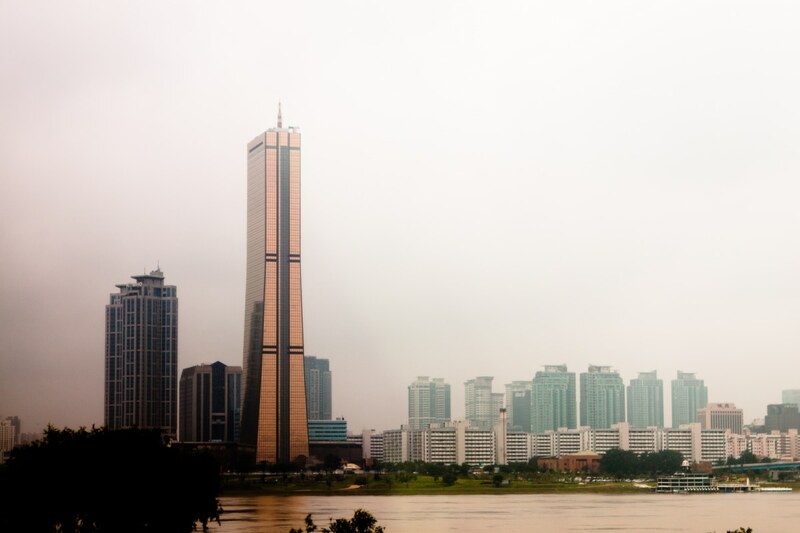 At 250m, it used to be the tallest building in South Korea, completed in 1985 as a symbol for the 1988 Olympics in Seoul. The top floors are public, containing what is said to be the highest art gallery in the world, an observation deck, and some restaurants. An interesting feature is a panoramic elevator leading you all the way to the observation deck. The base of the tower is dominated by a shopping mall, aquariums, and cinemas. The 63 Building is not located close to any stations so you will need to take the free shuttle bus, taxi or walk. Three stations are served by the free shuttle bus: Daebang (Line 1, exit 6), Teouinaru (Line 5, exit 4) and Yeoido (Line 5 or 9, exit 5). The S-Trenue is an exceptional tower. It escapes from the boring, overdone boxy highrise by being creative with how you deal with FAR and GFA requirements. Instead of building a low and chunky building, like most of its neighbors, MASS Studies designed a group of slender, slanted towers which lean on and off each other, creating gaps in between filled with green. The tower is a mix of commercial, residential and office. The lower podium contains shops and is publicly accessible. Most interesting, however, it how it sits on the site, and how it stands out from its neighbors. The tower is located directly at exit 3 of Yeouido Station, on Line 5. Get a prepaid SIM card: in Seoul, you can purchase it at major convenience stores, Incheon airport or Korean mobile service provider stores (KT, SKT, LG). I got a 4G Unlimited from KT. CityMapper app : one of the best apps to help navigate public transport works really well in Seoul. It helps you find subway and bus routes and even tell you where to get o while you ride. You can also use it online. I tried to rent the Seoul city bikes and, after a long and messy registration process, I realized the bikes were unusable if you are taller than the average Korean population. The seats are really low and won’t extend enough. Not recommended. Seoul Travel Guide for Food Lovers Written by Mark Wiens at Migrationology , whose food tips are always on the spot. Explore Parts Unknown: Korea My favorite traveler Anthony Bourdain once did a great episode of his show Parts Unknown in Korea. This is the accompanying article and it is great. As I mentioned early, this guide is a work in progress. I intend to go back to Seoul many times and will continue updating this guide in the future. But this is a good start for you to start exploring this beautiful city and eat your way through its exciting architecture. The map includes all of the above, with photos for easy browsing while on the go. Also, some of the food recommendations from the guide plus many others are also included. If you like this guide, please share it! And any comments, corrections, and suggestions are always welcome.